We are so glad to have your honor to click on our site. This site is specially designed to introduce tungsten dart, tungsten dart billets, tungsten dart barrels, whole dart and dart accessories manufactured by Chinatungsten. 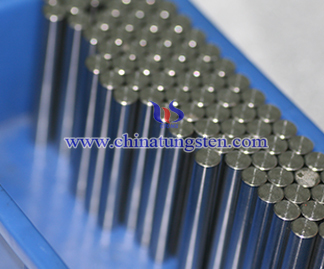 Nowadays, tungsten is widly applied to make dart to improve the quality and precision of tungsten dart barrels. 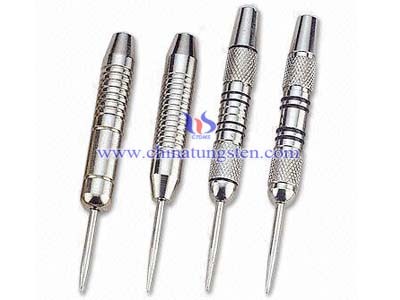 When it comes to darts sport, tungsten darts can not be separated. Darts can be divided into varieties by different materials; the different weight will make darts have different performance. When selecting darts, the first consideration should be where it is most suitable for you or not. Some people like darts to be slighter, some people like a little heavier. Usually, the most expensive darts are copper darts and tungsten darts, both are relatively heavier, and can be adjusted according to the different copper or tungsten’s containing amounts. Tungsten darts are more prevalent in a variety of clubs and professional tournaments, because of its smaller size, which due to the property of high density of tungsten alloy. High density means large weight; large weight means you can reduce its volume, make its body more slender, and let you feel much better. High density also means that it will have the better stability, so it will stabilize your performance in a game play. Tungsten darts has good corrosion resistance and wear resistance, that make it can be well used for a long time without damage. All these can be seen, tungsten darts is the best choice for you when doing darts sport. Tungsten is a very dense material, so darts with a considerable weight can be made quite slim. The invention of tungsten dart had a big impact on the sport. With the new darts it was possible to achieve much better grouping than before, and the averages in progames have improved dramatically.The tungsten alloy dart are designed and developed for the developing player. It gives the players of dart a positivity in playing at an affordable prices. 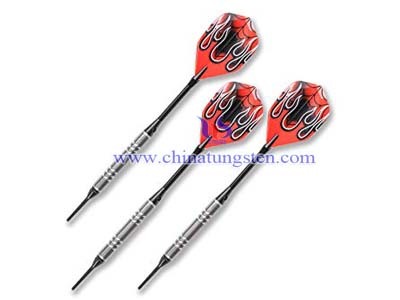 The series of tungsten alloy dart is available in a variety of vibrant colors, different weights and black steal finish. 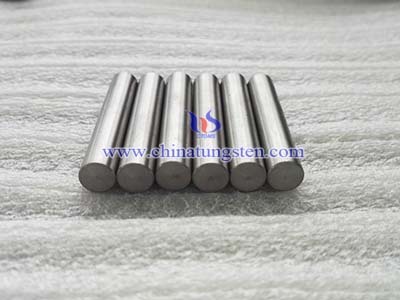 Tungsten dart billets are the raw material of tungsten dart barrels which form the main part of dart.Tungsten dart billets are actually tungsten cylinder rods after surface grinding by center-less processing, and their weights are varied from different tungsten contents and tungsten dart billets sizes. 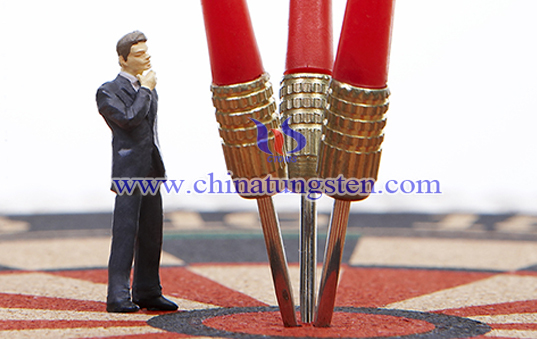 Chinatungsten is specializing in supplying all kinds of tungsten alloy darts, tungsten dart billets, tungsten dart barrels. We can offer various range of tungsten dart billets and tungsten dart barrels, including W-Ni-Fe billet, W-Ni-Cu billet, W-Ni-Cu-Fe, etc. Also we own mature technique of surface grinding and centre-less processing.We can also manufacture darts according to customers` specific designs. 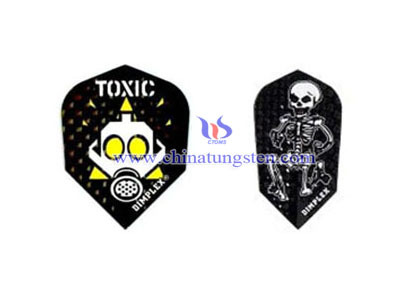 Our normal standard tungsten dart billets'size are as below: Normal standard sizes(from 65W to 95W) , please choose what exactly you need and refer to us for any other information you want to know. We appreciate very much to receive your particular designs, and always try all out to meet any specific requirement.The motto of our company is that, there never be minimum order, but any one could bring to us the most potential buyer.